After your application is accepted and working with you we have decided what kind of a bunny you are looking for, we will bring two or three of them to you to meet and greet. That visit is (hopefully) when we will complete the adoption. Therefore we need you to have bunny's living area set up and ready to go (if you are buying gently used items from us, just have a place cleared out where you plan to have bunny have its "home base".) Remember when you first get bunny you are going to want to give it a small area to start and give it more and more run room a little at a time. You want to make sure bunny doesn't get overwhelmed and forget where its litter plan is. This will also allow you some time to "bunny proof" your home a bit at a time. We also can give you idea for that as well. The pictures on this page illustrate starting from the easy and inexpensive "puppy pen" on an end run of vinyl tile (always recommended and easy to find at any large hardware store), a cage or cage bottom for bunny's hay rack, water bottle, and litter pan - we always recommend getting the largest litter pan that you can and that will fit in the space - (the cage bottom helps contain any messes in one spot) to the elaborate and very expensive pens. You can get most of these items inexpensively at stores like Target, Meijer, Walmart or even on the net at places like Amazon. Below are several examples of the kind of living arrangements every bunny should have. A cage is not enough! Even if you plan on letting bunny free roam when you are at home, during the time you are not home he should have lots of space to play. The first picture is made with a store bought rabbit cage that holds bunnies litter pan and hay. The playpen gate is zip tied with electrical ties (can be bought at any hardware store) to the cage to make for a secure area. The flooring we found at Home Depot and a 12' x 9' roll piece was about $100. It is a nice thick soft vinyl that they won't slip on but is very soft on their feet and will protect your carpeting and is washable. 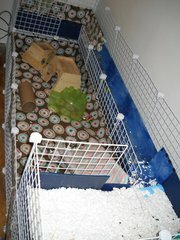 We suggest keeping bunny in a set up like this for a month or so, allowing supervised visits to the rest of the house. Once bunny remembers where the litter pan is and gets comfortable in its surroundings then you can give bunny more run of the house, remembering always to "bunny proof" all electrical cords (including chargers, lamp cords, computer cords, etc). You can buy plastic conduit at hardware stores very inexpensively to cover your cords so bunny can't chew them. 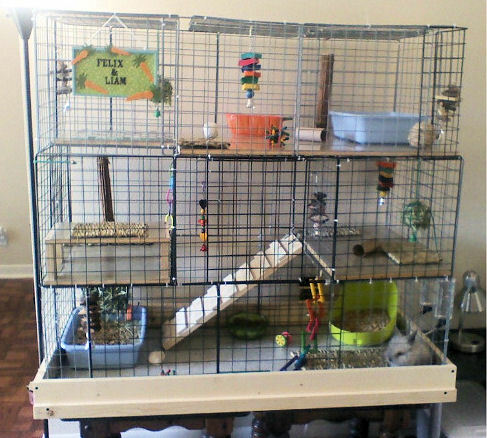 This set up is also perfect to put bunny in at night so they have a safe and secure sleep area. We will add pictures of more exotic and "spoiled bunny" set ups so you can let your imagination run wild. The above pen was made with what is called "C & C" grids which can be purchased online or at all stores like K-Mart, WalMart, etc. They are usually sold as book shelves for kids rooms and we use zip ties to transform them into living spaces making sure that all ledges and ramps are covered with wood, vinyl or cardboard so little bunny feet don't get caught in the grids. If you need help finding the grids, let us know and we can help find them. At the visit we bring bunnies to you, since it will be the adoption visit, you will want to have kibble, hay and at least greens for breakfast and dinner. Here is a list of acceptable foods for bunny. General guidelines are to feed a minimum of 1 cup of fresh greens for each 4 lbs. of body weight, per day. Select three to four types of greens (i.e., leafy lettuces, kale, chard, mustard greens, parsley, etc.) daily. A variety is necessary in order to obtain the necessary nutrients, with one each day that contains Vitamin A, indicated by a * on the accepted list on the second page. Add one green item to the diet at a time. Eliminate if it causes soft stools or diarrhea. Remember - each rabbit is an individual, and you will need to alter these guidelines to meet your rabbits' specific requirements based on his health and sensitivity to certain foods. Limit fruits to 1 or 2 very small pieces (size of a quarter) no more than 1 or 2 times per week - none if your rabbit is dieting or has soft stools. Choose from the attached list below of high fiber fruits. Sugary fruits such as bananas and grapes should be given only sparingly, as occasional treats, in very tiny portions (1/4" slice or 1 to 2 grapes). Dried fruits have concentrated sugars so should be given in only very tiny pieces and only sparingly. If you give dried papayas or cranberries, for example, they should get only 2 small pieces a couple times per week - at most. Again, only if they are very healthy and not overweight. Bunnies have a sweet tooth and if left to their own devices will devour sugary foods to the exclusion of healthful ones. 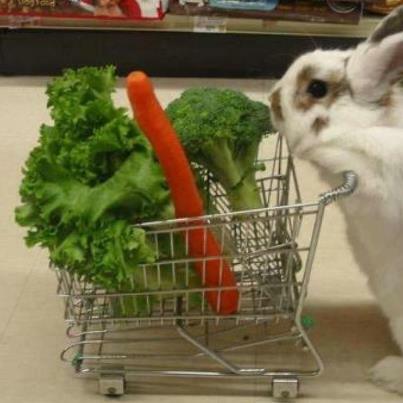 It's up to you to make sure your rabbit's diet is healthy. After all, they don't have the option of shopping for themselves, so they depend on you to feed them foods that help them to live long and healthy lives. These foods should make up about 75% of the fresh portion of your rabbit's diet (about 1 packed cup per 2 lbs of body weight per day). These should be no more then about 15 % of the diet (About 1 tablespoon per 2 lbs of body weight per day). These should be no more then 10% of the diet (about 1 teaspoon per 2 lbs of body weight per day). NOTE: unless otherwise stated it is more nutritious to leave the skin on the fruit (particularly if organic), just wash thoroughly. IF you are in doubt about the source of the fruit and you are concerned about chemicals in the skin, then remove it.